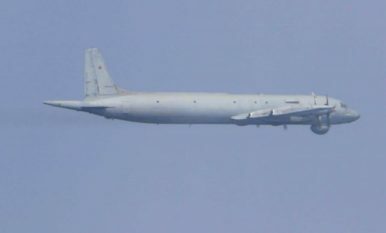 Japan Air Self-Defense Force (JASDF) fighter jets scrambled to intercept a Russian Navy Ilyushin Il-38N “Dolphin” maritime patrol and anti-submarine warfare aircraft over the Sea of Japan on March 27, Japan’s Ministry of Defense (MoD) said in a recent statement. The intercept occurred in international waters as the Il-38 was conducting its mission along the eastern rim of the Sea of Japan. Japanese sovereign airspace was reportedly not violated, according to the MoD. The March 27 scramble constitutes the second intercept of a Il-38 maritime patrol aircraft in 2019; the previous intercept took place in January. The Il-38 is a derivative of the four-engined turboprop Ilyushin Il-18 transport aircraft for use as a maritime patrol aircraft for the Soviet Navy. The aircraft first entered service in the 1970s. The Il-38N is an improved variant of the original version and has been fitted with a the new Novella mission system, which boosts the aircraft’s electronic reconnaissance and tracking capabilities. The Russian military has been stepping up its aerial presence near the Japanese islands in recent months. In February, JASDF fighters intercepted four nuclear-capable Russian Tupolev Tu-95MS strategic bombers and four Sukhoi Su-35S (Flanker-E+) multirole fighter jets flying in two separate formations over the east and west coasts of Japan. [Another] intercept of a Russian Su-24 strike attack aircraft or fighter-bomber took place in the Sea of Japan on December 19, 2018, which marked the first Russian aerial patrol in close proximity to the Japanese islands following a five-week hiatus. A previous intercept of a Russian military plane—an Ilyushin Il-38 “Dolphin,” a maritime patrol and anti-submarine warfare aircraft—took place on November 8. Two Russian Ilyushin Il-20 maritime reconnaissance and anti-submarine warfare aircraft were also intercepted on October 19. Another intercept of a Russian air patrol that included a Sukhoi Su-35S (Flanker-E+) multirole fighter jet, one Sukhoi Su-24, and one unidentified plane over the Sea of Japan took place on September 20. The JASDF also scrambled fighter jets to intercept two nuclear-capable Russian Tupolev Tu-95MS strategic bombers and support aircraft in July. The Tu-95MS is an updated variant of the older Tu-95, a Soviet-era four-engine, long-range, turboprop, strategic bomber that can carry stand-off nuclear-capable cruise missiles. Recent Russian patrol activities have not been without casualties. A pair of Russian Su-34 fighter-bombers crashed into the Sea of Japan after reportedly colliding with each other off the coast in Russia’s Far East in January, resulting in the death of three out of four crew members.